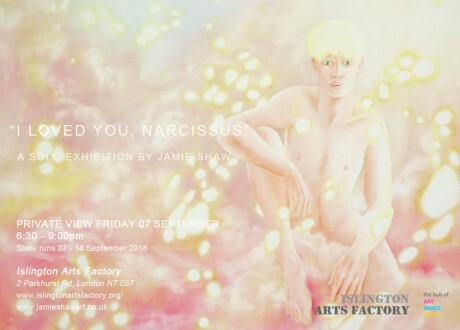 Opening Reception Friday 07th September 6:30pm – 9:00pm (complimentary beverages). After-party TBC. Jamie Shaw (b. 1992) is a painter and visual artist based in London. 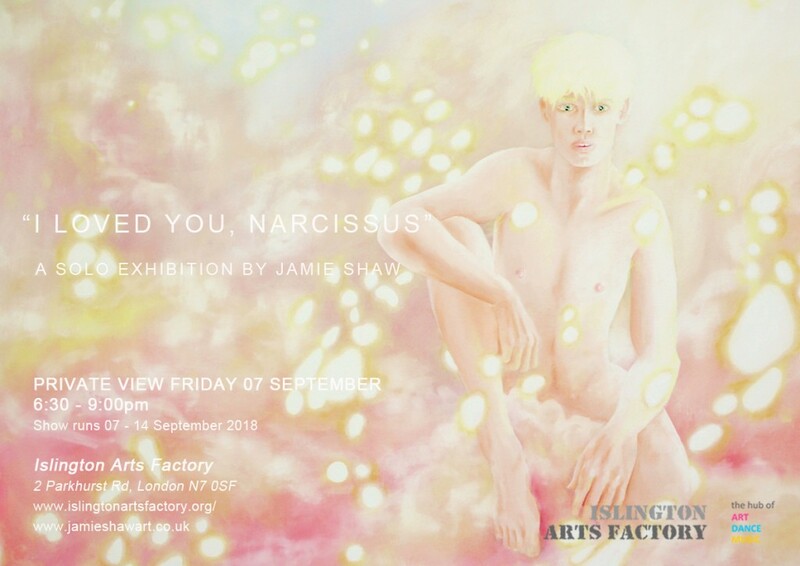 With “I Loved You, Narcissus”, the Islington Arts Factory presents Shaw’s first solo exhibition in the capital. The show is curated by the artist and takes a retrospective format, aiming to provide a cohesive snapshot of a unique and determined practice as it has developed over the last four years. Shaw treats his art practice as a realm of personal expression related to contemporary lived experience, believing that the personal is political. He works with intention to create intimate, sentimental musings concerned with expressing desire, longing, and failures in dreaming. His paintings and texts examine the discrepancies between sexuality and innocence, and examine the interstices between consumption and desire; marginality and complicity; kitsch and sublime. He counts life, difference, and innocence amongst his main inspirations. Shaw aims to create poetic encounters of a vision informed both by the minority queer experience (specifically the deconstruction of traditional standards of masculinity) and myths of the artist as ‘outsider’ which emerged with Romance. The work expresses personal struggles in desire and constitutes a failed quest for ‘pink utopia’. Shaw works incessantly to create his own mythology, and his deities live on a pink cloud. In De Certau’s “practice of everyday life” it was first suggested that the power of the individual consumer lie in his tactics of consumption: the way in which a consumer chooses to navigate immovable frameworks of power, coercion and imposed standards of desire by his selection, manipulation and personal revaluation of media and spectacle to suit his own needs . In a contemporary context, Shaw’s practice takes this a step further. To compose his paintings, he appropriates aesthetic, narrative and thematic devices from wide-ranging sources: from Disney movies to fashion magazines, from pop music lyrics to fine-art paintings. He takes these sources, dismantles and manipulates them, queers and recasts them as part of his own individual and unwavering narrative of expression – which in turn can be consumed, within the context of fine-art, as spectacle: providing emotive moments of self-reflection, escapism and quiet in an otherwise frenetic and difficult world.